It would be fair to say the massacre of around 100 Palestinian villagers by Jewish Stern Gang and Irgun terrorists in the village of Deir Yassin nearly 70 years ago is not well remembered today. Like many of the horrific events surrounding the creation of the state of Israel, the massacre on April 9, 1948 has been quietly dropped down the memory hole. It was a horrific tale of British betrayal and Jewish ruthlessness, and is still too embarrassing for both Jewish elites and the British government. But those events have now come back from the grave and might have a pivotal effect on who is to become a future British prime minister. For Britain is on the verge of a small political earthquake if, as seems likely, a far-left politician becomes leader of the opposition Labour Party. Not only is Jeremy Corbyn a bit of a seventies throwback with his beret, beard and leftie enthusiasm for anti-austerity measures, there is another factor that sets him well apart from the other three safe, establishment candidates. For no friend of Israel is he. Jeremy Corbyn is a long standing supporter of the Palestinian cause and has shared platforms with many Muslim radicals in the past including Hamas. And the prospect of him as leader — and potential future prime minister — has been enough to send the Jewish media lobby into a meltdown. As a result Corbyn has been on the receiving end of the biggest media barrage of abuse since Nigel Farage’s anti-immigration UKIP looked like it was making huge gains at the last general election. This is where Deir Yassin comes in. For one of the directors of the Deir Yasin Remembered group set up to commemorate the memory of those horrific events, is a Jewish blogger called Paul Eisen who is also a Holocaust revisionist. Eisen is an ardent supporter of Jeremy Corbyn. Corbyn has attended Deir Yassin Remembered meetings in the past, and so by dint of the smearing tactic known as ‘guilt by association’, his critics have chosen to attach the word “holocaust denier” to him. This has been enthusiastically seized by the Daily Mail which decided Eisen was effectively public enemy number one and that Corbyn was tainted because of their past friendship. The Jewish Chronicle then made much of its “seven questions that Corbyn must answer” . The Jewish-owned Daily Express then repeated the Jewish Chronicle accusations and asked if Corbyn was anti-Semitic himself. Finally Corbyn did answer back, and an interview on Channel 4 News by Jewish journalist Cathy Newman, was particularly striking for her insistence that Corbyn’s alleged anti-Semitism was the only possible issue that British voters could care about. There is no mistaking the tone of incandescent anger and bafflement of the elite Jewish media clique at this turn of events. From the Guardian on the left to the Express on the right to Haaretz and the Jerusalem Post, they have been popping fuses. You would think this internal fighting would warm the hearts of Labour’s opponents. But as is usual, it is remarkable how Jews from across the political spectrum will circle the wagons. Here, for instance, is a Jewish Chronicle column by — Conservative — advisor Lord Finkelstein, a good friend of David Cameron, and, remember, a political opponent. The election of Jeremy Corbyn as leader would not be a problem for the Labour Party. It would be a debacle. A catastrophe. A calamity. A disaster. While Ed Miliband was not wildly popular with most Jews, he took a respectable position on Israel. It wasn’t one I shared, and I was heavily critical of it. It even outraged many members of the community, who were bitterly disappointed with his position on the last Gaza action. It was, however, a respectable position, for all its faults. Jeremy Corbyn is in a different place altogether. He shares the virulent anti-Zionism of the hard left. One that seeks to make Israel a pariah state. One that treats Israel as if it were the central cause of all foreign affairs problems. One that treats with Hamas and is friendly to Hizbollah. Where are the rallies featuring every person who has ever served in a Labour cabinet or Shadow cabinet? Where is Gordon Brown’s national tour? Where is Ed Miliband’s personal appeal?…do panic! The Twitter feed of Jewish Chronicle editor Stephen Pollard has been glowing white hot with indignation as has that of the other members of the Jewish media chorus. Oliver Kamm, Hugo Rifkind, and David Aaronovitch of The Times. In the Spectator Nick Cohen claims that Corbyn reveals anti-Semitism on the left is now as bad as on the right. Even former Labour prime ministers Tony Blair and Gordon Brown have waded in and said Corbyn would be a disaster. Corbyn responded with a promise that there would be war crimes investigations into the Iraq war if he came to power. Elites on both sides correctly see that Corbyn could be the undoing of not only Labour but of the Conservatives as well. For in a system where both parties are just the same bottle with different labels, exposing one undoes the other. Corbyn would certainly be a break in a long line of PM’s all of whom have bent the knee to Israel. Corbyn was a leading member of the anti-war movement, led the protests against Israel’s atrocities against Palestinians and has also spoken out against the deportation of various Islamic preachers. He has also called for a British boycott of Israeli universities. This Channel Four interview gives a fair taste. Here is another one. 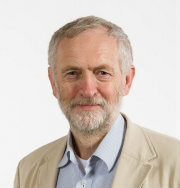 Rather unexpectedly, this beardy socialist is now the leading contender to become leader of the Labour party. If he does, it is fair to say that Jewish Labour in this country is all but finished. You can understand the frustration. Under Tony Blair and his successors the Labour Party was in the pocket to Jewish financiers to such an extent that it might as well have had Star of David ribbon around it. David Cameron’s sole achievement with his Conservative government has been to make his party even more subservient to the Jewish lobby. Indeed, the Corbyn surge is just one element of a much bigger phenomenon. In the aftermath of the recent Greek crisis, in which the Syriza government was humiliated, Donald Tusk — the head of the European Council — declared that he was “really afraid of this ideological or political contagion, not financial contagion, of this Greek crisis. … For me, the atmosphere is a little similar to the time after 1968 in Europe,” warning of a “widespread impatience” which, when “a social experience of feeling” became “the introduction for revolutions.” Indeed, all over Europe, social democracy is crumbling in favour of xenophobic right-wing parties, like Ukip, the National Front and the True Finns, or populist left-wing parties like Syriza and Podemos. There is a growing political ferment, finding its expression in lots of different ways, causing mounting fear among the European elite. Corbynism is just one manifestation. This point bears repeating: European politics has entered into a very unstable phase, and that terrifies current elites that have brought about the current state of dissatisfaction with the status quo. Most members will have cast their postal votes by the end of this week although the result will not be announced until September 12. Every poll has shown that Corbyn is the favourite with the rank and file and it is not hard to see why. As with Donald Trump it is a relief to see someone — however flawed — who at least seems to be his own man and says what he thinks. Also there is no hiding the fact that a huge section of the Labour Party are delighted that someone who is not a pre-vetted, “Friend of Israel” can make it to the top. While it is always fun to see the elites tear themselves apart, be warned — Jeremy Corbyn is no friend of Whites. He is a Marxist to the core. He was a stalwart anti-White campaigner in the past and has fought with tooth and nail, any attempt to reduce immigration. There is another factor that no-one is mentioning. There are only about 300,000 Jews in Britain. The potential four million Muslim block has formed an increasing proportion of the Labour vote and will only grow larger. Indeed, Muslim Labour Party voters control some of the most rotten and corrupt boroughs in Britain. It is a fair bet they will not be turning out for Israel’s convenience. It would be ironic that the Jewish lobby, which has always looked at the Labour Party as in the bag, were to be undone by the very mass immigration policies which they have pushed for. As has been said, not for the first and last time, be careful what you wish for.